CONGRATULATIONS TO JANA LEAH B! Family...like Granny Zula says, we are three gallons of crazy in a two gallon bucket. When it comes to me and my sister, Charlotte Rae, she's the crazy one even though I'm the one who was diagnosed with the Funeral Trauma. Just like most sisters, Charlotte and I were a little competitive in the funeral home business. After all, she did leave Eternal Slumber, our family funeral home, and began to work for a big funeral home that was more than just laying corpse in the casket. She went to work for the Hardgrove's Legacy Centers. They hosted baby showers, bridal parties, and even catered events right along side of a funeral. Granny said that she'd never seen the like: "You can go to a baby shower in the morning and walk over to a layout to pay respect in the afternoon." But back to the Funeral Trauma. What is the Funeral Trauma? Well, I think Doc Clyde made it up to make granny and Charlotte feel better after I had a perilous run in with a plastic Santa falling on top of my head and knocking me flat out! I thought I was a goner, gone to visit the big guy in the sky like the clients I stuck six feet under when I was visited by the ghosts of people I've put six feet under. Only they tell me that they can't cross over until I can figure out who killed them. KILLED THEM??? I'm an undertaker, not a criminal investigator. Or was I? A couple of years later, a few Betweener clients murders solved (yeah...they're called Betweeners, stuck between here and there), I've got the hardest client yet. Yep. That's my sister. When she realized I could see her in her new ghost state and when I realized I was the only one who could now see here. . .our relationship took a turn. The thought of my sister being dead and I was the one who had to help find her killer was bitter sweet. Don't get me wrong, I want to bring the killer to justice and get my hands on them, but when I do find out, Charlotte will cross over and I'll never see her again. 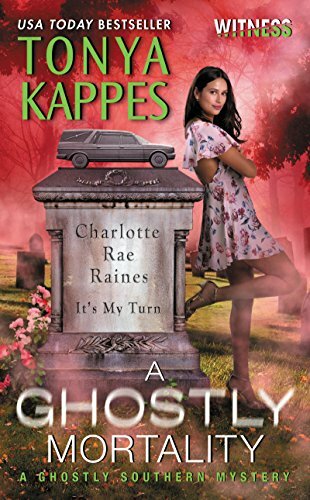 Of course Charlotte's murder has about put Granny one foot in the grave and when Charlotte told me she wanted IT'S MY TURN on her tombstone, Granny about flew off the handle. It's a little undertaker humor that Granny didn't see fit. I just might take my time trying to figure out this murder. READERS!! What do you want to say on your epitaph?? Leave a comment and be entered to win a tote and four-in-one measuring spoon! Be sure to jump over to my Facebook author page to enter to win my weekly MONDAY MYSTERY GIVEAWAY! And you can head on over to my website and sign up for my newsletter and receive a FREE ebook mystery novel! See what readers are saying about A GHOSTLY MORTALITY! Do you want to be in a book club? Be sure to join Death Becomes Us Cozy Mystery only book club on Facebook. We have so much fun! Be sure to follow the link HERE! I am not sure what I want. I shall leave that up to my kids. They are very creative. She always had a never-ending tbr stack of books to read. Not sure what I want but something upbeat and positive. Or something funny. Mine has to be something sarcastic or it just wouldn't fit my personality. haha! Not sure. Maybe something about me trying to do my best to treat people with respect & kindness. I want to be cremated and my ashes scattered with the ashes of my dogs that have passed before me. Therefore no waste of money on a tombstone. I want mine to say "Crazy cat lady"
I want to be created and my ashes scattered with my fur babies ashes. Lived and L9ved Well. My husband says he is going to put on mine "I told her so" because I always push the envelope and he just shakes his head. Like when I went into anphalactic shock and almost died because I kept telling him it would get better I didn't need to go to the hospital lol. Book Lover To The End! "See You In A Little While" or "I'll Be Seeing You" with a few of the musical notes that go with the lyric. But, in reality, do not expect to have a tombstone. She crossed the rainbow bridge to be with her critters. I told my daughter I wanted to be cremated. I need to be in a urn with the following: UKjo "Go Big Blue!!!" Now I'm going to Tahiti! She loved her family, cats, and books. I think I would leave that up to my sister. She knows me better than i know myself and has a way with words. 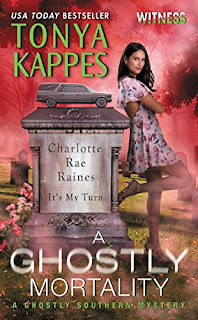 Love this series and can't wait to read "A Ghostly Mortality". Oh my gosh! I seriously just posted exactly what I wanted because I found the exact bible passage that my dad used for my mom. I then took from it for him and also have a highlighted part for me. It's not creative or funny...but wow, this is eerie how I was just looking at this. 2 Timothy 4: 7-8 I have kept the faith. It would have to be something sarcastically funny. Was a great Nana to her grandkids! And always had a book to read! She made this world a better place.